NOTE-I : Paper-I will consist of Objective Type- Multiple choice questions only. The questions will be set both in English & Hindi. The Commission reserves the right to set the questions additionally in regional languages subject to technical feasibility. NOTE-II: There will be negative marking of 0.25 marks for each wrong answer. Candidates are, therefore, advised to keep this in mind while answering the questions. NOTE-III: Paper-II will be descriptive in which the candidate will be required to write short essay/letter in English or any language included in the 8th schedule of the Constitution. NOTE-IV: Paper-II will only be of qualifying nature and is intended to test elementary language skills in view of recategorization of the post as Group-C and in view of job requirements. NOTE-V: Paper-II will be held only for such candidates who meet the cut-off prescribed by the Commission in Paper-I for different categories. The date and time of the Paper will be communicated to shortlisted candidates in due course. Commission reserves the right to set separate qualifying standard in any Part of Paper-I. Paper-I Questions on ‘General Intelligence and Reasoning’ will be non-verbal considering the functions attached to the post. Questions on Numerical Aptitude and General English will be simple, of a level that an average matriculate will be in a position to answer comfortably. Questions on General Awareness will be also of similar standard. General Intelligence: It would include questions of non-verbal type. The test will include questions on similarities and differences, space visualization, problem solving, analysis, judgment, decision making, visual memory, discriminating observation, relationship concepts, figure classification, arithmetical number series, non-verbal series etc. The test will also include questions designed to test the candidate’s abilities to deal with abstract ideas and symbols and their relationship, arithmetical computation and other analytical functions. English Language : Candidates' understanding of the Basics of English Language, its vocabulary, grammar, sentence structure, synonyms, antonyms and its correct usage, etc. his/her writing ability would be tested. Numerical Aptitude: This paper will include questions on problems relating to Number Systems, Computation of Whole Numbers, Decimals and Fractions and relationship between Numbers, Fundamental arithmetical operations, Percentages, Ratio and Proportion, Averages, Interest, Profit and Loss, Discount, use of Tables and Graphs, Mensuration, Time and Distance, Ratio and Time, Time and Work, etc. General Awareness: Questions will be designed to test the ability of the candidate’s general awareness of the environment around him and its application to society. Questions will also be designed to test knowledge of current events and of such matters of everyday observation and experience in their scientific aspects as may be expected of an educated person. The test will also include questions relating to India and its neighbouring countries especially pertaining to Sports, History, Culture, Geography, Economic scene, General Polity including Indian Constitution, and Scientific Research etc. These questions will be such that they do not require a special study of any discipline. NOTE: For VH candidates of 40% and above visual disability and opting for SCRIBE there will be no component of Maps/Graphs/Diagrams/Statistical Data in the General Intelligence & Reasoning / General Awareness Paper. The Paper will be set in English and Hindi and to the extent possible in other languages mentioned in the 8th Schedule of the Constitution as given in Annexure-X, to test basic language skills commensurate with the educational qualification prescribed for the post. Candidates will be required to write one short essay/letter in English or any language included in the 8th schedule of Constitution. 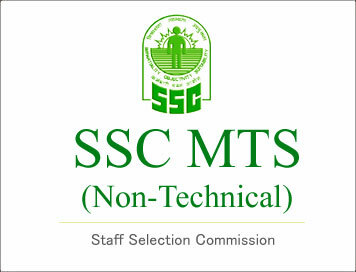 SSC MTS (Multitasking Non-Technical Staff) Exam "Notification, Syllabus, Exam Papers, Study Kit & much more..."